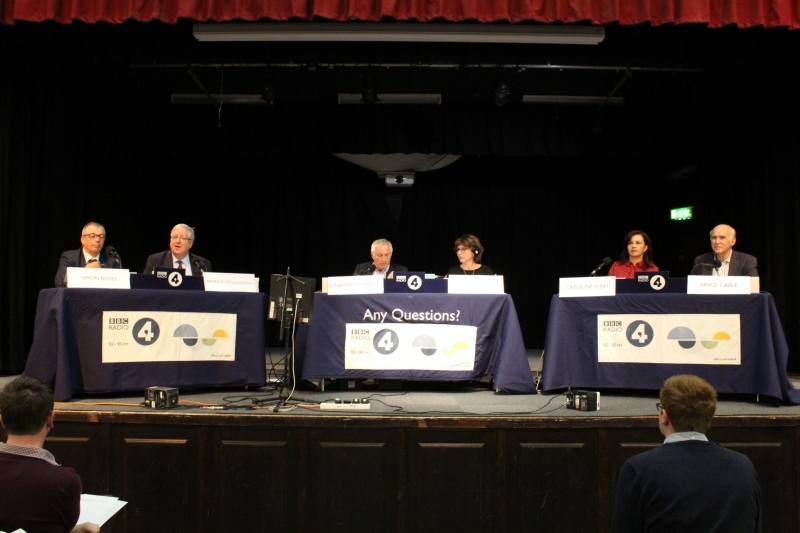 On Friday September 15th Thomas Hardye School was the venue for a Live Broadcast of ‘Any Questions’ for BBC Radio 4. Thomas Hardye School were invited by the BBC to host the programme after the school had put its name forward as a possible host. The BBC will only approach establishments and organisations that have expressed a wish to host the programme. Our offer was submitted by Judith Wardlaw, our recently retired Science and Industry Co-ordinator and organiser of the very popular Community Lectures at the school. BBC Technicians arrived during the morning to set up the equipment and make sure the sound would be perfect on the night. They were supported by the Thomas Hardye ICT Technicians. During the afternoon the Production Team arrived and set up a Production Room in the school. From here they used Social Media to keep people informed about the broadcast and give advanced notice on submitting questions for the Panel. The Panel and Jonathan Dimbleby arrived around 6.30. They were greeted by sixth form students and head teacher Mike Foley. However, it was our own Mrs Taylor who got the biggest cheer of the night for asking a question about pay increases for public sector workers! The audience was very enthusiastic and played their part in the success of the broadcast. Jonathan Dimbleby compered the show with consumate and well practiced (apparent) ease, keeping everyone on track. After the show he and the Panel retired to the school staffroom for refreshments and chatted willingly and enthusiastically with staff and students. But this was not before they made sure of a few ‘selfies’ for their own scrapbook. The Thomas Hardye School were delighted to host such a prestigious programme and enjoyed co-operating with the talented BBC people.